RAMCO has built many unique multistage systems. This customer required precision cleaning of several different families of jet engine components for overhaul. The system had to clean penetrant and a variety of inorganic and organic soils from deep within various sized blades as well as large diameter rings. Different alloys such as aluminum, stainless steel and titanium had to be accommodated. 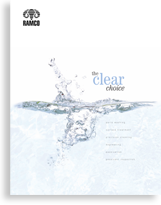 Acceptable cleaning chemicals had to be used in accordance with stringent specifications. 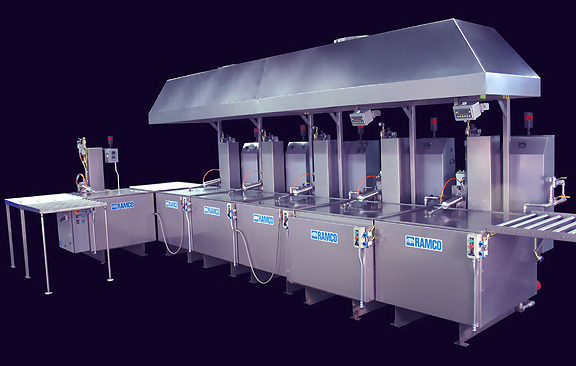 A six stage processing system was developed at RAMCO involving turbo/filtration for prewashing with ultrasonics and turbo/filtration for precision washing followed by triple cascading immersion rinses using DI water. The last stage was a hot air knife dryer. The elevator was used to sequence powerful ultrasonic cleaning and turbo/agitation washing. The turbo/agitation washing removed gross contaminants and the ultrasonic cleaning the finer and/or more resistive contaminants. The result was a very effective processing routine and faster cleaning. The steps were sequenced with digital cascading timers for agitation washing and ultrasonic cleaning phases. The ultrasonic stage could be set to provide vertical oscillation of the work during the sonic cycle. A selector switch was provided for static ultrasonic or oscillating ultrasonic modes. And using our MultipleRollover feature the dual mode process could be repeated for any number of preset rollovers. RAMCO ultrasonic systems provide superior ultrasonic washing action over conventional (static) systems by moving the work through the peaks and nodes of the wave energy. Vertical immersion pumps are used in the first two process stages as part of the Turbo/Filter systems. The use of vertical pumps eliminates seal problems inherent with centrifugal pumps. This is especially beneficial when using high pH, low pH or abrasive chemicals. An overhead exhaust system is provided for the first five processing modules. It is designed for 150-200 cfm per square foot of opening. The hood extends along the line of wet tanks and terminates at the top with dual tubular axial fans. Positive mechanical ventilation (in accordance with recommendations from the chemical manufacturer – MSDS sheet) is designed to limit the accumulation of chemical vapors thereby making the system safer when the cover is open. Furthermore, limiting the spreading of chemical vapors from the surface of the solution to the surrounding area will lessen any hazard to the immediate environment. The prewash and precision wash stages include PLC programming with multiple processing recipes. Ultrasonic power control is incorporated into the process parameters to automatically cut back on sonic power for sensitive metals (such as aluminum) and adjust process times and temperature accordingly.